I hope you all had a great weekend! A headache knocked me out for most of Sunday so we thoroughly enjoyed a day of complete laziness. Love those kinds of Sundays. Today I've got another travel post to help beat the Monday blues. FYI- This is picture heavy! Siena was one of the highlights of our trip! 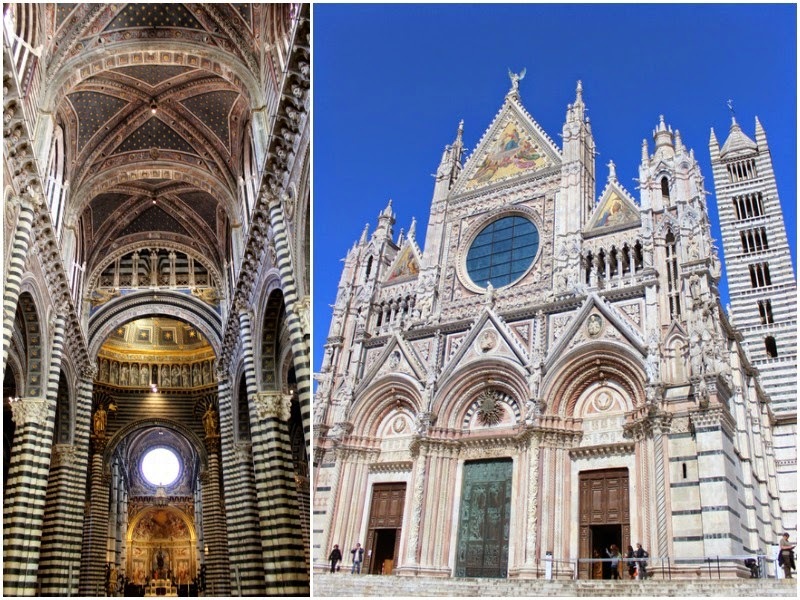 If you're trying to decide where to stop on an Italian getaway, please put Siena (and the Tuscany region) on your list. Siena and its tiny nearby towns have this charming medieval feel that you just don't get in the other big Italian cities. In my last Rome post, I mentioned that we took the train instead of the bus to Siena. 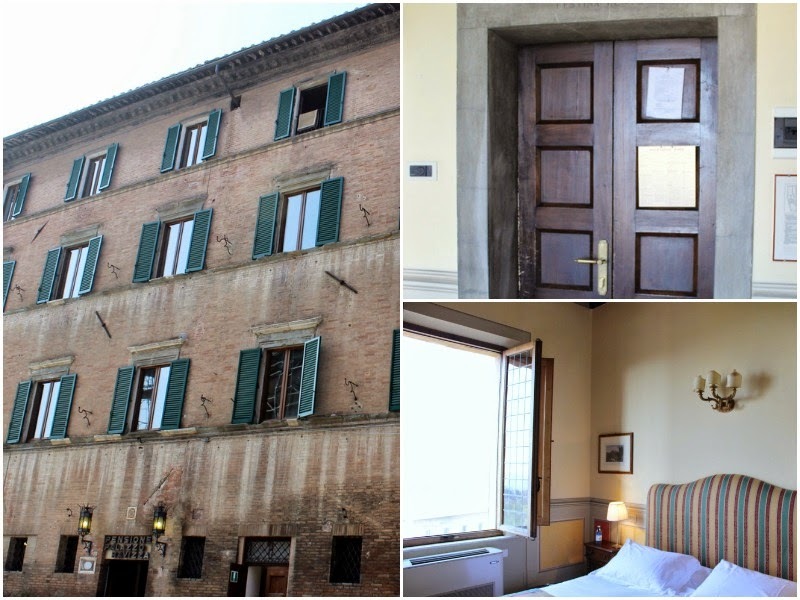 The train station is kind of far from the old part of Siena, so we opted to cab it to our hotel, Palazzo Ravizza. Our hotel was beautiful. Palazzo Ravizza's best feature was the patio. It was just along the walls of Siena, so it was still a quick walk into Piazza del Campo but has the most beautiful Tuscan hillside views. We bought a liter of their house wine for about $5 and sat on their patio watching the sunset our first night. Talk about perfection! The hotel still has so much of its old charm, including double doors to the hotel rooms, beautiful high ceilings, and black and white tile in the lobby. The breakfast was delicious and everyone who worked there were so sweet. The one negative for us was that the walls were thin, but I wouldn't let it deter you from staying there. We were so happy we did. The view from our hotel room. You can see the city walls and the patio below. Oh also, the hairdryers at our hotels looked like mini vacuums on the wall so if my hair is a hot mess in these photos, you know why. The first day in Siena we visited all of the main sites. You can easily do the Duomo, Baptistery, Crypt, and Museo dell'Opera Metropolitana (great views from here) in just a couple hours. We got the combo ticket for 12 euros per person, and though we didn't spend much time in the crypt and baptistery, it was worth stopping in just because. We also climbed the Torre del Mangia (City Tower), mostly because it was Steve's mission to climb every tower possible during our trip. So many steps but the views were always worth it. See that archway? Steve walked up there, the guardrail goes only as high as your knees. I couldn't even walk out onto that level, it was terrifying! We celebrated St. Patty's Day with some Italian beer at Ristorante Alla Speranza right on Il Campo. I mentioned this pizza here, it was one of my favorites from Italy. A lot of places charge a couple extra euros per person if you sit in the outdoor area, so between that and Steve's massive beer, this was a pricey lunch. I obviously couldn't miss out on gelato, so we split a cone and sat in the square like the locals. For dinner that night we found another restaurant on Piazza del Campo. Our second day in Siena was our winery tour with Franco Fadda. We were fortunate to be the only tour group he had that day, so we basically had a private tour of Tuscany and its wineries with Franco. At 125 euro a person, it was an absolute steal. Franco was a fabulous tour guide, you can really tell he loves what he does. 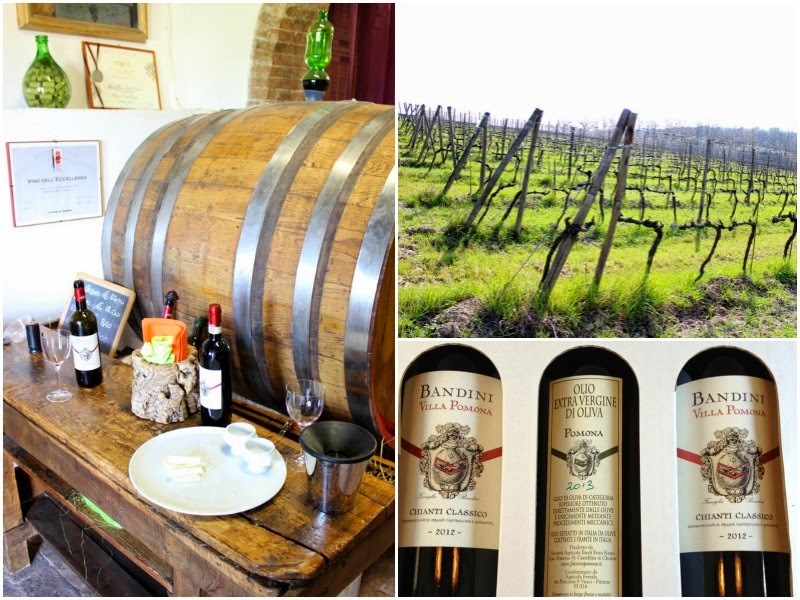 Our first stop was at a small, family run winery in the Chianti region called Villa Pomona. We spoke to the winemaker/owner and she gave us a tour of the grounds. I couldn't believe how much effort is put into making the wine, and it was obvious that she really loves it. Our tasting there consisted of the Chianti Classico and Reserve wines, as well as some delicious Olive Oil. Our second winery stop was a much larger winery, Castello D'Albola. We toured the facilities here too which was so interesting to contrast with the smaller winery. Franco had us tasting tons of delicious wine there and we were able to compare the same wines from different years to see how aging changes the taste. We had lunch at the most charming family-run restaurant, Bar-Ucci, in Volpaia, a little town of just 40 people. Everything was absolutely delicious, between the caprese salad, lasagna, and tiramisu. We just kept telling the owners everything was delizioso! 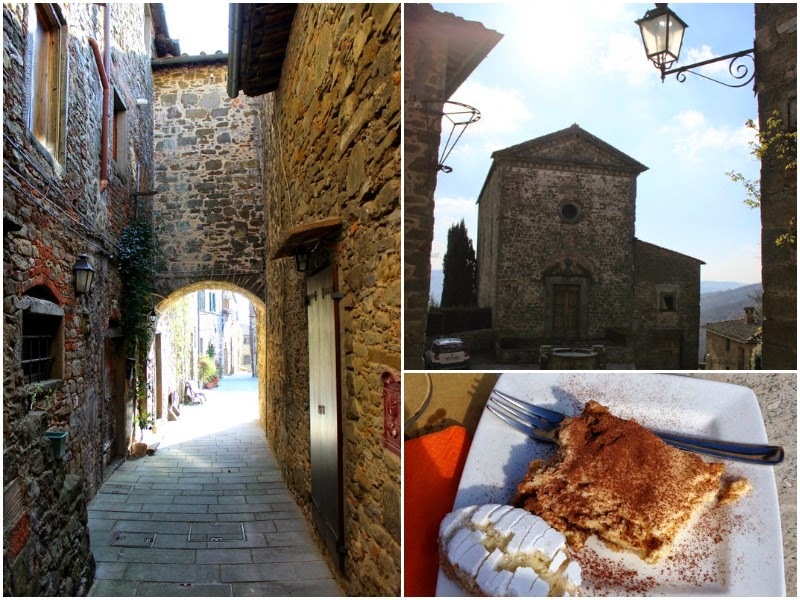 We stopped at a couple more charming little Tuscan towns, including one that only had 15 permanent residents, before Franco brought us back to the hotel. It was an amazing tour, if you're heading to Siena please contact him! Unlike Rome, Siena closed down pretty early, at least on the weeknights we were there. We were so tired so we didn't even have a full dinner the second night. We did sneak in a trip to Nannini for Siena's famous ricciarelli cookies. Oh my goodness, I miss those almond cookies. I immediately wished I had bought like 20 more. The next day we headed back to the train station en route to Florence! Has anyone been to Siena? Feel free to email me if you are heading there and have questions! Absolutely dreamy! We loved Siena as well! The Duomo is incredible! That winery you visited looks lovely too! We didn't go to Siena but you are making me want to go! Loving this. Such beautiful pictures girl. These pictures, are amazing. That sunset one is PERFECTION. Oh.My.Gosh- these are incredible/beautiful pics! :) Love it! Thank you so much Lindsey!! I will check it out now! Great pictures! We did a day trip that went to Siena and a few other towns in Tuscany and it was our favorite part of our trip. We definitely didn't get to see or do as much as you did though, since we were only there for the morning. Looks like fun! At least you got to spend a little time there! :) Glad to hear you enjoyed it!! The flowers, the wine, the pizza, the scenery....goodness this is all so amazing! That picture with the wine and sunset......I can't even it's so beautiful! LOVING all of those blue skies!!! Ah these photos are bringing me back! We stayed in a villa in Tuscany while we were there for two days. It was seriously so incredible. Memories to last a lifetime! That second picture is gorgeous! What an amazing trip that you'll never forget! Gorgeous place! So jealous of your awesome trip!! Oh wow! Pure perfection!!! Love the views from your room! We almost made it to Siena! So close! But my husband was tired of traveling around so we spent the extra day in Florence instead. Maybe I'll make it there next time! The amazing thing about Siena is that it is a medieval town that is still mainly intact as it once was.